Congrats to Brasilian Jesse Mendes who won the 2014 ASP Prime event in the Azores riding his board shaped by Matt “Mayhem” Biolos. This is Jesse’s second ‘QS win of the season and catapults him to 6th in the qualification ratings. Top 10 at the end of the season qualify for the World Tour. There’s now four events left to go (Portugal, Brasil, Haleiwa and Sunset). Also congrats to New Zealand’s Ricardo Christie who finished equal third riding his …Lost board. Check the official ASP update on the contest below + photos & video. All photos and words from ASPWORLDTOUR.COM/Damien Poullenot. 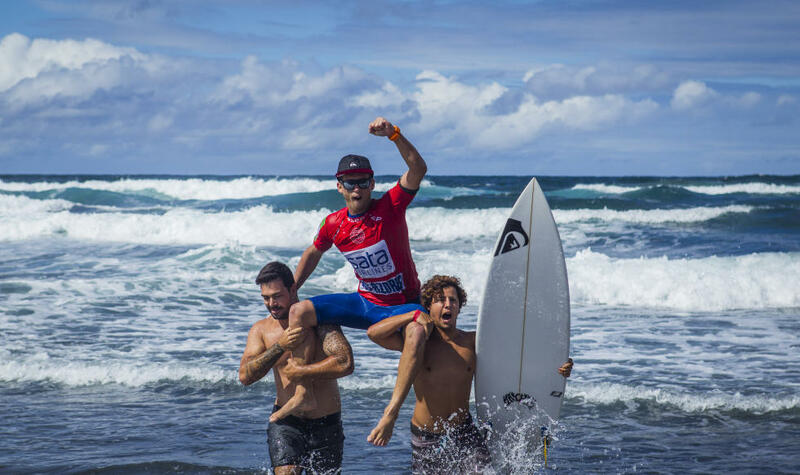 Jesse Mendes (BRA), 21, has won the ASP Prime SATA Azores Pro pres. by Sumol, defeating Joan Duru (FRA), 25, in an exciting 35-minute final. Mendes also takes an early lead in the Portuguese Waves Series – Cascais Trophy, part of the ASP Qualification Series (QS). The three-event series that includes Azores, the Cascais Billabong Pro and the Moche Rip Curl Pro Peniche, and offers a bonus $50,000 to the overall winner. Surfers turned on the crowds with an opening exchange right at the buzzer. Duru took off first, closely followed by Mendes, the advantage going to Mendes with a 7.50 against Duru’s 6.17. The talented Brazilian, carrying momentum from his Semifinal performance, quickly backed it up with a 6.17 to take an early command of the Final. The two hungry QS campaigners took the battle to the next level when the split a peak, Duru on the right, Mendes on the left, but, ultimately, both fell short of improving their situation. After a brief lull in action, the Brazilian added a 7.03 to put Duru in a difficult position. Not feeling the pressure, the Frenchman launched into a straight frontside air to try and reduce his requirement. In the meantime Mendes selected a beautiful wave on his forehand, nailing two big turns for an excellent 8.33 and solidifying his event victory. In the first Semifinal, Mendes picked off great waves to start building a good scoreboard in the opening minutes, while Ricardo Christie (NZL), 25, wasted a few tries on waves offering no potential. The Kiwi eventually spotted a good lefthander and performed two big turns to bank a 7.50 and launch his campaign. Quickly backing it up with a 4.00, Christie tied the heat totals at 11.50. Mendes rapidly picked off a good left of his own, performing a critical turn under the lip for a 7.43 and the win. Christie placed equal thrid, collecting 4,225 ranking points in the process.